The King Solomon and Marakoopa Caves are some of the best caves in Australia, and draw visitors from around the world. Within 8 km (5 mi) of each other, both are close to the town of Mole Creek. Both caves are electrically lit and guided tours are available (its possible to purchase a combined ticket for both caves). Marakoopa Cave (pictured right) is the larger of the two, and has a spectacular glow worm display. It is the only glow worm cave in Tasmania open to the public. The name "Marakoopa" is from the Tasmanian Aboriginal word for "handsome". King Solomon Cave is slightly smaller, although still spectacular and more conveniently located. The cave was named for one of the formations, which visitors see approximately in the middle of the 40 minute tour. Using a little imagination, look at the picture to the left. At the bottom in the lit (orange) area are calcite deposits which sparkle and look like diamonds. In the top-centre of the image is a profile of King Solomon keeping watch over his diamonds. Try and pick out the eye, ear, nose and beard - and the reason for the cave's name is revealed. If the photograph doesn't show up well enough on your screen, click the image for the face to be outlined - or visit the caves and look for yourself! 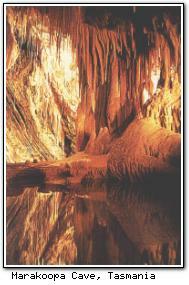 King Solomon and Marakoopa Caves are part of a whole cave system in the Mole Creek area. Although they are the only ones readily accessible to the public, it is possible for the more active to take guided tours of "wild" caves.